Welcome to our review of Bovada's online sportsbook here at USAOnlineSportsbooks.com. As you might already know, Bovada is one of the most popular sportsbooks for USA players and a lot of that has to do with this website being run by the same people that were in charge of what used to be Bodog.com. In late 2011, the company that owns both brands decided to launch an all-new brand just for U.S. players with the same great service and betting odds that Bodog was known for... Bovada is that creation. If you were at all familiar with the previous brand you will already know what's going on, with the exception of a new, better deposit bonus, everything else remains the same. Those new to this brand will catch on quickly as it has always been easy to use in all aspects of betting whether it be sports wagering, horse betting, online casino play, or online poker play. Plus, the rest of this review has everything you need to know contained on this page. To learn more or to find out how to sign up, just keep reading our Bovada sportsbook review. Does Bovada Sportsbook accept US Players? Absolutely! 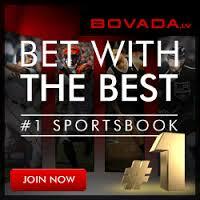 Bovada was created just for USA bettors and they therefore serve the United States. Unfortunately, not all U.S. players will be able to join Bovada. It is a little-known fact but players from New Jersey, Nevada, Maryland or Delaware are allowed to join this sportsbook due to past difficulties paying players that lived in those states. Instead of not paying them in a timely manner and having upset customers, Bovada opted to just exclude those states for the time being. If there are any updates, we'll post them right here! If you are from one of those states, you are not completely out of luck. For you, we recommend that you visit BetOnline as they accept players from all 50 U.S. states, or you can check out our BetOnline review to learn more. But, if you are not restricted from joining Bovada, we definitely recommend it as it is the best sportsbook available to U.S. players right now. To become an account holder at Bovada, bettors will need to fill out information on the signup page to complete the form. Bovada will need to know certain information to verify your identity, ensure you are old enough to play, and protect you from future fraud. Bovada is a very secure website and the information included in the signup is quite important. In total, the process to create your account might take you three minutes. It's verified through your email, which then gives you the ability to make deposits into the account to begin placing bets. Is Bovada Legal In The United States + Is It Legal to Bet Sports at Bovada? We wanted to make sure to cover legalities in our Bovada review for USA players. To answer this, let us first say that there is nothing stopping you from joining Bovada as long as you are of age and the bookmaker accepts residents of your state. There are no federal laws that make Bovada illegal, as it is an offshore sports betting operator. Laws can differ from a state level, but not many governments have opted to regulate online gambling. As such, you can place bets at Bovada without having to worry about breaking laws. Read more about legal sports betting in the United States here. Is Bovada Sportsbook Safe For USA Players? Not only is Bovada one of the safest online sportsbooks available, but it is also among the most trusted. Unlike some online sportsbooks, Bovada goes out of their way to keep their players safe when using their site. They have state of the art software to protect players accounts as well as their personal information. You do not have to worry about them selling your information, contacting you multiple times, or anything else that makes you uncomfortable. We want to make it clear in our Bovada sportsbook review that the site is safe for USA players to bet at and we consider them to be one of the most trusted sportsbooks available. This book is great because it allows anyone who meets the gambling age as set by their state to bet on sports at Bovada. Officially their stance is that you must be 18, but you do need to abide by any local laws which might set that number higher. Bovada has a great range of bonuses that start with a $250 deposit bonus when you make your first deposit. In this case, the site will give you a 100% bonus of your initial deposit to bet on your favorite sports, make ridiculous parlay bets or whatever else you want to do here. This bonus carries a low rollover and players can convert those bonus dollars into real cash pretty quickly. Another way to increase the Bovada bonuses for sports betting you get is by referring friends. When you tell someone to join, and they do, you will receive a 100% bonus of your friend’s deposit up to $100. This helps both the bettor and the book work in harmony. It’s not a huge difference for big bettors, but could allow you to add a small piece extra to each bet, and that could eventually roll over into big money. The latest promotional offer at Bovada's online sportsbook is their $5,000 Welcome Bitcoin Bonus. The online cashier will give you a 50% match on your first-ever bitcoin deposit, up to $250. The code to redeem the sportsbook promo is BVSBITCOIN50. You also have the option to claim a 150% casino match bonus that can be redeemed three times, giving the offer a $4,500 value. Use code BVCBITCOIN150 for the casino portion of the bonus. The rollover requirement at Bovada for their Welcome Bonus is only 5X. This means that the deposit amount and the bonus will have to be played a minimum of five times before a withdrawal can be made. Otherwise, Bovada would just be handing out free money to be paid out. The 5X rollover is actually quite low when considering that other sportsbooks have 10-time rollover requirements on similar deposit bonuses. Sports betting options found at Bovada range across sports like UFC, betting on NFL football, European soccer, auto racing, tennis, golf, wagering on NBA basketball games, rugby and more. Each sport available has a subset of betting options like prop betting, player props, and futures which makes it easy to find the bet you are looking for or discover a new bet that interests you. Bovada is known for having some of the best futures odds in the business that update pretty frequently. Additionally, they also allow bettors to place wagers on current events that aren’t exactly sports, like celebrity marriages, reality TV shows, and even political elections. These types of specials often rotate on a seasonal basis, or when a new pop culture event occurs. Current Sports In Season at Bovada: NFL + College Football, NBA Preseason Basketball, NHL Hockey, PGA Golf, NASCAR Sprint Cup + more! If you're looking for a go-to sportsbook for NFL + College Football season, Bovada really kicks it up a notch to ensure that bettors have all of the lines and information at their disposal. Throughout Bovada's football season, bettors will have the chance to wager on a ton of game action. This includes full sections for both college football and the NFL. It's not just game lines which can be found at Bovada however, as they also offer team props and game props each week that comes along with the games as well. Futures wagers like for events like the Super Bowl will be up all season long in the NFL, while BCS Championship lines can be found for college football. Outside of the standard games odds and other betting lines that can be found when betting on football at Bovada, various promotions are formed as well. These promotions can be different every season. Bovada likes to give their bettors new and unique opportunities every year. Each season there are plenty of great things to expect, certainly making for an exciting time for Bovada account holders. If you ran out of the house today without placing your wagers and think you are out of luck, think again. That is because Bovada Sportsbook runs flawlessly on several mobile platforms including Apple's iPhone, any smartphone running Android, as well as tablets like the iPad. This is great because you no longer need to be tethered to your laptop or desktop PC in order to place a wager. One thing to note about Bovada's mobile betting option, it is not an actual app you can download from the App Store or anything like that. It is simply a well optimized mobile version of their website that basically functions much the same way a dedicated app would. Furthermore, Bovada will provide you instructions (if needed) to add their icon to your home screen. Going this route will allow Bovada users to tap one button to go straight into the sportsbook in order to log-in. Betting on sports online has more options than ever before, with new and exciting ways to create betting lines never before seen. One such area Bovada has is live in-game sports wagering. It's pretty much how it sounds; a simple enough concept. But the technology and ingenuity of Bovada to allow this is fascinating. Bettors now have the capability to place bets in the live betting section at Bovada, which produces many games to bet. It won't have a full schedule of every game in every league going, but there will be plenty of choices. Clicking into the different games available will throw you into the mix, where the betting odds and payouts on a bet slip can be filled out. Bovada is a brand built upon reliability and dependability, which is why you can count on their deposit and withdrawal methods. Bovada knows that USA bettors have unique needs when it comes to banking at an online sportsbook, which is why they only accept certain methods. There are just a handful of payment options at Bovada, but they are all 100% secure so that you can bank with confidence. Another perk is that the sportsbook will cover withdrawal fees once a month, which comes to huge cost savings. The funding methods at Bovada include bitcoin and credit cards, while the withdrawal methods are bitcoin and checks. Bitcoin is the digital currency that has taken the sports betting industry by storm. It is extremely fast and even more reliable than using a credit card. Your bitcoins are guaranteed to be processed and applied to your sports betting account almost instantaneously. Rather than the headache of having to enter account information, all you have to do is send the bitcoins to the wallet address supplied by the Bovada cashier. The cashier never charges any fees and the amount of the deposit does not affect the speed of delivery. Credit cards are a staple on the Bovada banking methods list. You can use your Visa or MasterCard to make an instant payment to be credited to your account. Bovada even accepts Visa gift cards, which can be a better option than your standard credit card in terms of approval rate. Just make sure that the card specifies that it is good for international purchases. Bitcoin withdrawals at Bovada are faster than the speeds of other sportsbooks. While others allot 48 hours for processing, you can receive your bitcoin payout within 15 minutes of being approved. There are no complicated transfer instructions, just give your bitcoin wallet address to the cashier for processing. Bitcoin is the only banking method that is relatively anonymous, which is just another perk of using this banking method. There are also no fees. Bovada delivers checks much faster than other cashiers, with some sites taking more than a week just to process the request. This is one of the oldest payout methods around, but it proves to be reliable time and time again. Just verify your address with the cashier and have your cash sent to your mailbox. The cashier will cover your deposit fee once every 90 days, but there is a $100 processing fee for additional withdrawals. Contacting a representative on this site is easy with a click on the “Contact Us” link at the bottom of the page. You can send an in-site email with a generally fast response time, or you can call to speak with a representative at 1-888-263-0000 for general support. Bovada also offers live chat, where you can be directly connected via chat to a customer care representative.. Click here if you would like to contact Bovada's support. Is Bovada.lv regulated in the USA? Bovada.lv is not regulated in the USA, though they accept American sports bettors. If Bovada wanted to obtain US licensure, it would have to go meet individual state requirements. The site was once licensed in Canada, though the operator now is based primarily out of Antigua. Both locations have thriving remote gaming industries, which is why the Bovada brand holds itself to such high standards. Does Bovada.lv accept players from my state? Bovada.lv accepts players from almost every state in the U.S.A. The exceptions are NJ, DE, MD, or NV. The restriction is due to conflicting laws in these states, though none of the states specifically ban the use of offshore sports betting sites. As long as you live outside of these four states, you can create an account at Bovada. Bovada.lv can be trusted with your financial and personal information. When you create your sports betting account, all of your information is confidential. The site uses SSL technology to ensure that all monetary transactions are transmitted through a secure connection. You can trust Bovada with your money, contact information, and to have a good time. Are Bovada.lv scams an issue I have to worry about? No, Bovada scams are not an issue that you have to worry about. Many bettors are aware that the CEO of Bodog once ran into some legal trouble for operating in the US without proper licensure, but this was not in any way a scam that impacted bettors. The site is great with payouts, reliable, and is the best option for players wanting an online sports betting experience. Does Bovada.lv have a mobile betting app? Yes, but not in the traditional sense. Rather than having to download a mobile sports betting app from the App Store or GooglePlay, bettors can visit the mobile-friendly sportsbook from their handheld device. This gets rid of compatibility issues, taking up space, and pesky updates that come along with apps. Bovada’s mobile betting site features a similar layout with just as many betting options. Can I call in bets at Bovada.lv from a phone? Bovada does not allow players to call in bets. If you want to bet on sports you will need to place wagers from the desktop or mobile site. Does Bovada.lv payout to USA players? Yes, you can count on Bovada to pay out its USA players. In fact, the online sportsbook has based its withdrawal methods on those most reliable for American sports bettors. Players can request their winnings via bitcoin or courier check, with the cryptocurrency being the fastest payout option at Bovada. Bovada.lv does not accept PayPal, nor does any other offshore sports betting site for USA players. This is because PayPal has its own gambling policy that prohibits regulated and unregulated gambling transactions via its platform. Right now, the closest option to an eWallet at Bovada service is Bitcoin.